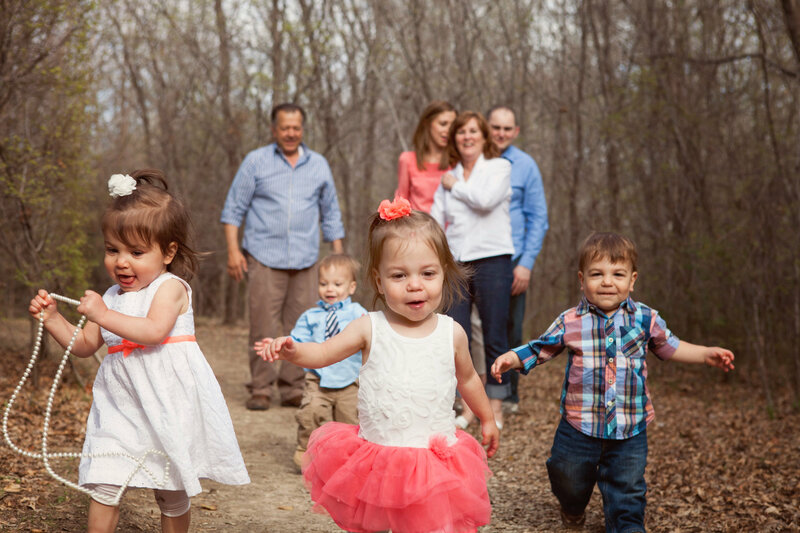 With each passing day, I find myself trying to solve some new challenge with raising four toddlers, aka “quaddlers”. They are a cunning lot who inspires a little ingenuity on my part (and George’s) just to manage day to day life. 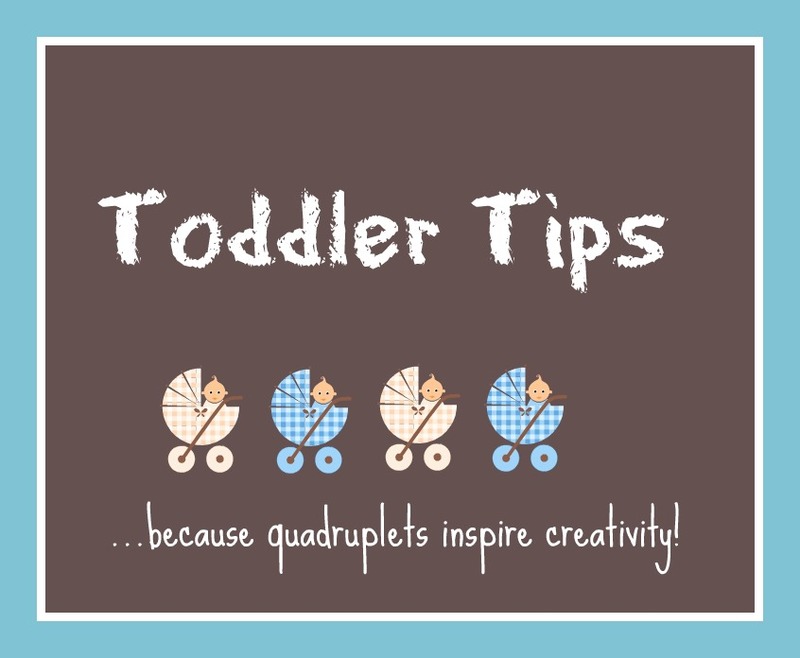 While my ideas are born from being surrounded by four toddlers, I think many of them could be helpful to any parents of little ones so I’m sharing. 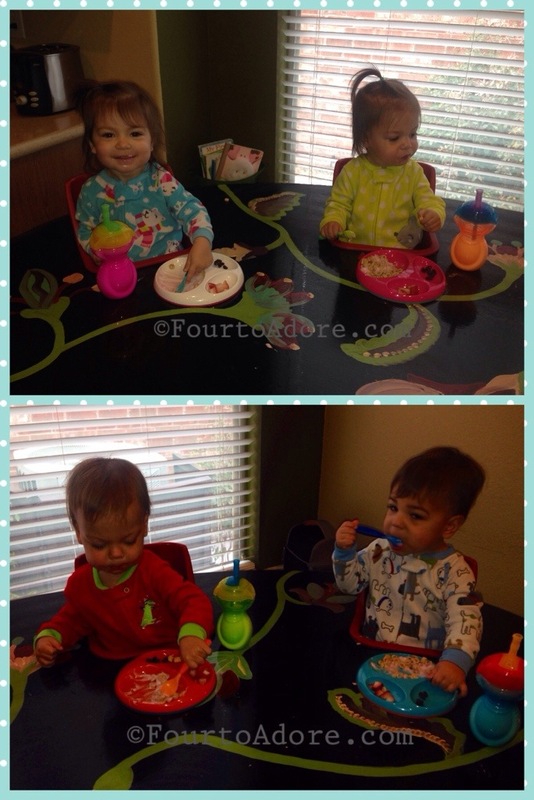 Being independent toddlers, the quads refuse to let me spoon feed them anything. For the most part, it’s not a problem because they are highly skilled at finger feeding and are using utensils a little better each day. Some foods such as applesauce and yogurt don’t lend themselves to finger feeding and aren’t ideal for novice utensil users. This led me to find some alternative solutions, especially for yogurt. I snagged this little gem from Gwen’s Nest. I put a little yogurt in the bottom of a bowl or plate and top it with dry cereal. 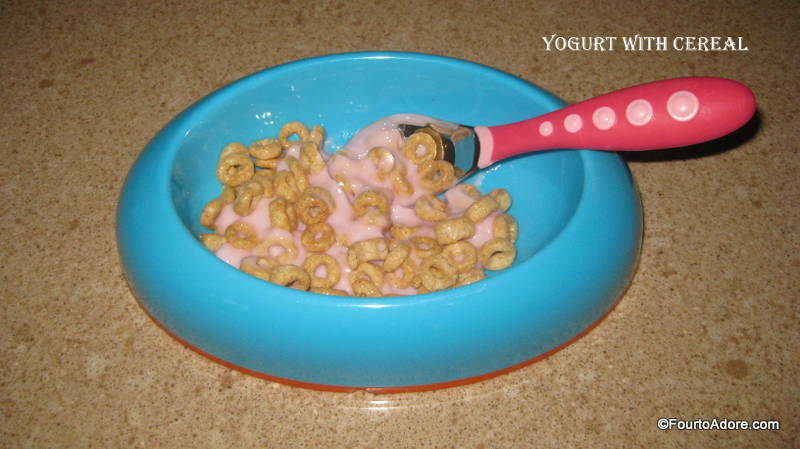 This is one of my favorite ways to serve yogurt because it helps the babies work on spoon-feeding themselves. The yogurt sticks to the dry cereal, making it easier to scoop. Sometimes they pick up the cereal as a finger food, and it’s a bit sticky, but it’s not terrible. I also found a recipe for Orange Dreamsicle Bites from Cookies & Cups, which used Greek yogurt and orange flavored Jell-O. I experimented with it and found that other Jello flavors make tasty yogurt bites for the wee ones (and adults too!). Plus, using other flavors creates fun colors, which is helpful when teaching toddlers about colors. The best part- Greek yogurt transforms Jello-O into a snack packed with probiotics, calcium, and protein that is easy to serve and clean up! Note: I’ve experimented with various brands and flavors of Greek yogurt for this recipe, and Chobani vanilla results in the right texture. Microwave the mixture 1 minute then stir well. Microwave another minute then stir again. 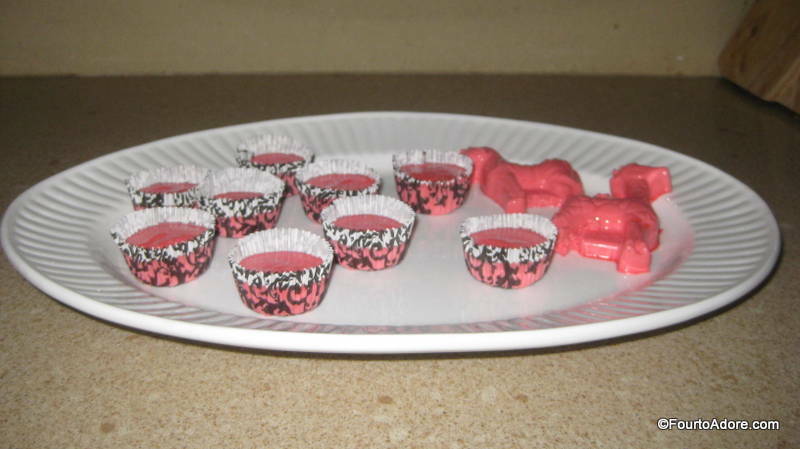 Spoon the mixture into molds, or muffin tins with cupcake liners. If you use a mold, be sure to spray it with cooking spray first. 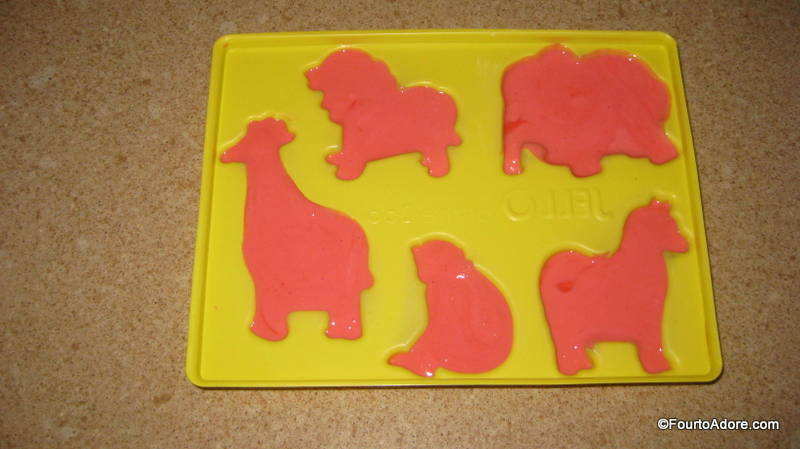 I forgot to spray my mold and only two of our animals came out clean. I found that mini muffin tins are just the right size for a snack, and clean up is a cinch. I made these as a toddler snack so I didn’t get fancy, but at Cookies & Cups, she topped these with whipped cream and candy, which would be cute to serve at a party. I’ve been serving banana milk shakes for a while, but recently began adding Greek yogurt to them. I also like adding yogurt to whole milk as a drink. 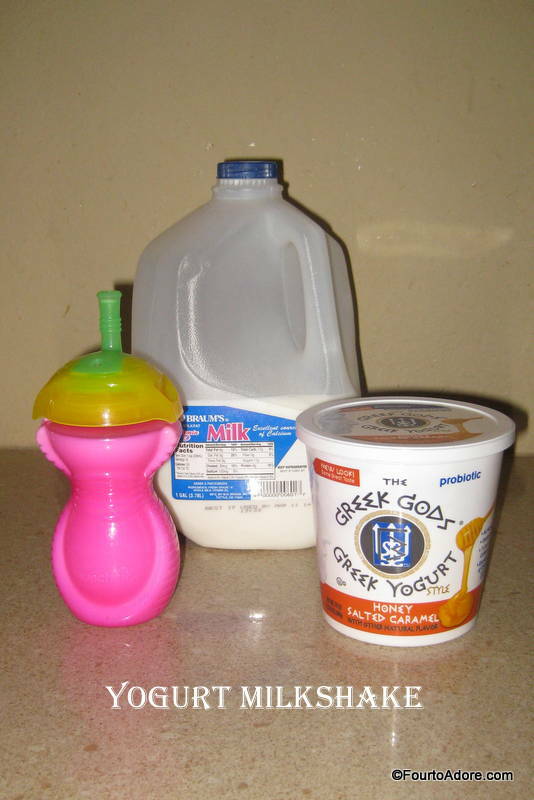 This is by far the easiest way to serve yogurt to toddlers! I do this often for Mason and Sydney because they are so tiny and often need extra calories that are nutritious rather than empty junk food options. Toddlers absolutely LOVE dipping. They recently discovered they joys of ketchup and sour cream so I began using yogurt as fruit dip for the quads. Sometimes they spear fruit with a fork, which is good utensil practice. They also do well just dipping fruit as a finger food. 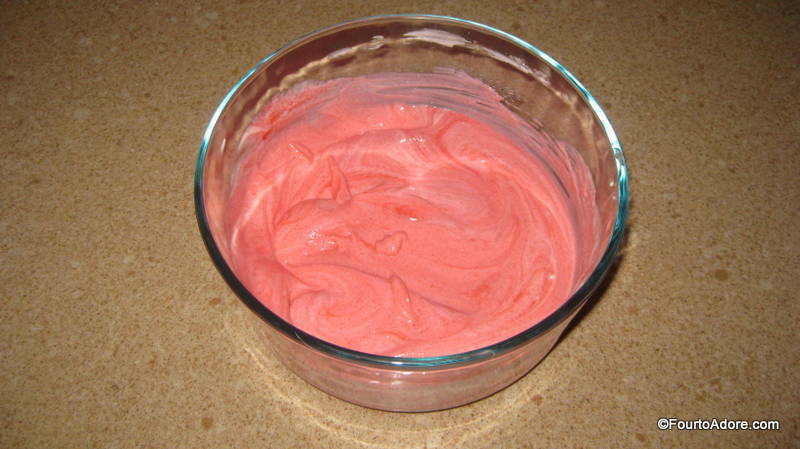 The yogurt I used for this was white, but I added a drop of red food coloring to make it pretty for the picture. Rylin is currently obsessed with pink things and thought it was fantastic. I think I’ll experiment with making our yogurt other colors such as green and orange to help teach colors. 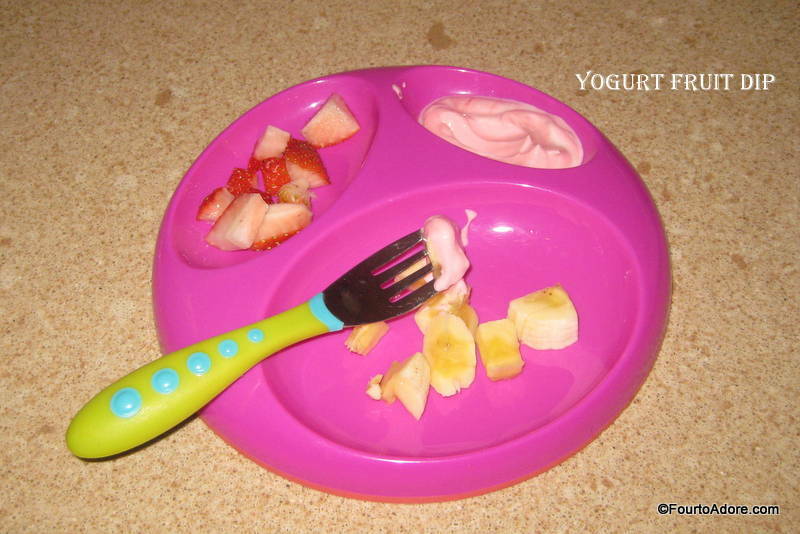 Do you have any clever ways to serve yogurt or otherwise messy foods to toddlers? I always enjoy tips for feeding toddlers, and have been enjoying the Tyke Bites series at Texas Tales. 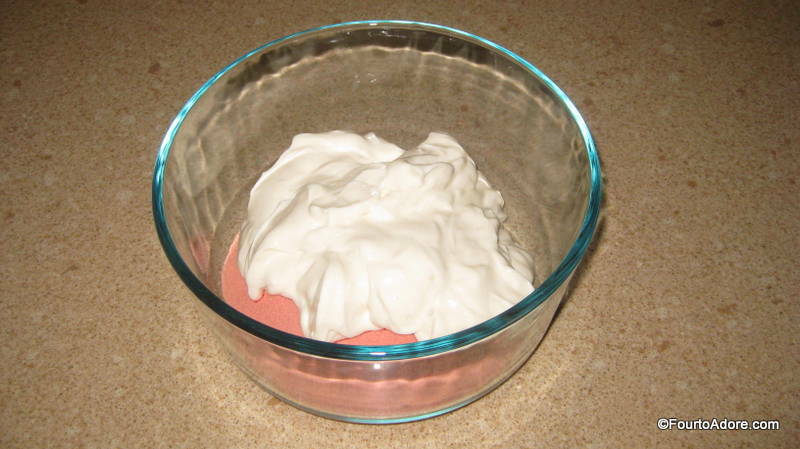 P. S. Since the original writing of this post, I began using plain Greek yogurt as a sour cream substitute as a condiment (e.g. over chili, tacos, in veggie dip), to add creaminess to pasta dishes, and in baked goods. There are so many creative ways to use Greek yogurt in your family’s meals. In fact, Chobani has an entire site devoted to such recipes! These look like fun. Be careful with green and blue, especially if you are going somewhere or taking pictures. It’s easy to stain lips, teeth and tongues those colors, very unnatural looking, as compared to red. My aunt once served St. Patrick’s Day “red” (subsitute green) velvet cake to the school board (my uncle was a principal). Boy was she embarassed! The whole school board had a green tinge for days! Hayley had blue ice cream at the mall just before gymnastics pictures and cried because we couldn’t get the blue off! Haha- good point! Also, blue food makes for very interesting diapers. Maybe I’ll stick to orange, yellow, red. We definitely won’t be eating anything bright before portraits, they are super messy eaters. I hope your littles love both! They just LOVE dipping don’t they? I hope they enjoy the new twists! My kiddos certainly do.